When I started making this salad I thought I had all the necessary ingredients to hand. But then I discovered that a) I didn't, and b) this is a very versatile salad! So the ingredients below show what I actually used. This made around 3 servings as a main meal served with either some nice cheese, meats, or boiled eggs. 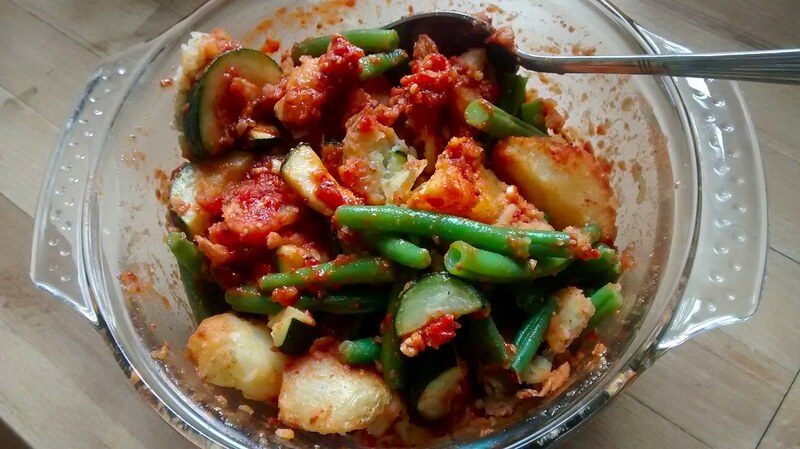 Nothing really changed from the original, so head over to http://www.thefirstmess.com/2013/07/18/grilled-potato-lemon-zucchini-salad-romesco-recipe/ for the how to and also to see what I omitted.